Juniperus communis is a small coniferous evergreen tree or shrub, very variable in form, ranging from 10 m (33 ft)—rarely 16 m (52 ft)—tall to a low, often prostrate spreading shrub in exposed locations. It has needle-like leaves in whorls of three; the leaves are green, with a single white stomatal band on the inner surface. It never attains adult foliage. :55 It is dioecious, with male and female cones, which are wind pollinated, on separate plants. The fruit are berry-like cones, initially green, ripening in 18 months to purple-black with a blue waxy coating; they are spherical, 4–12 mm (0.16–0.47 in) diameter, and usually have three (occasionally six) fleshy fused scales, each scale with a single seed. The seeds are dispersed when birds eat the cones, digesting the fleshy scales and passing the hard, unwinged seeds in their droppings. The male cones are yellow, 2–3 mm (0.079–0.118 in) long, and fall soon after shedding their pollen in March–April. As to be expected from the wide range, J. communis is very variable, with several infraspecific taxa; delimitation between the taxa is still uncertain, with genetic data not matching morphological data well. subsp. communis – Common juniper. Usually an erect shrub or small tree; leaves long, 8–20(–27) mm; cones small, 5–8 mm, usually shorter than the leaves; found at low to moderate altitude in temperate climates. subsp. alpina (Suter) Čelak. – alpine juniper (syn. J. c. subsp. nana, J. c. var. saxatilis Pallas, J. sibirica Burgsd.). Usually a prostrate ground-hugging shrub; leaves short, 3–8 mm; cones often larger, 7–12 mm, usually longer than the leaves; found in subarctic areas and high altitude alpine zones in temperate areas. Some botanists treat subsp. alpina at the lower rank of variety, in which case the correct name is Juniperus communis var. saxatilis Pallas, though the name Juniperus communis var. 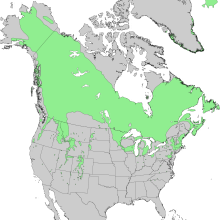 montana is also occasionally cited; others, primarily in eastern Europe and Russia, sometimes treat it as a distinct species J. sibirica Burgsd. (syn. J. nana Willd., J. alpina S.F.Gray). Juniperus communis is one of Ireland's longest established plants. The juniper berry oil is composed largely of monoterpene hydrocarbons such as α-pinene, myrcene, sabinene, limonene and β-pinene. It is too small to have any general lumber usage. 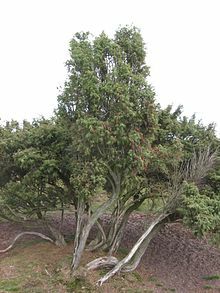 In Scandinavia, however, juniper wood is used for making containers for storing small quantities of dairy products such as butter and cheese, and also for making wooden butter knives. It was also frequently used for trenails in wooden shipbuilding by shipwrights for its tough properties. In Estonia juniper wood is valued for its long lasting and pleasant aroma, very decorative natural structure of wood (growth rings) as well as good physical properties of wood due to slow growth rate of juniper and resulting dense and strong wood. Various decorative items (often eating utensils) are common in most Estonian handicraft shops and households. According to the old tradition, on Easter Monday Kashubian (Northern Poland) boys chase girls whipping their legs gently with juniper twigs. This is to bring good fortune in love to the chased girls. Juniper wood, especially burl wood, is frequently used to make knife handles for French pocketknives such as the Laguiole. Its astringent blue-black seed cones, commonly known as "juniper berries", are too bitter to eat raw and are usually sold dried and used to flavour meats, sauces, and stuffings. They are generally crushed before use to release their flavour. Since juniper berries have a strong taste, they should be used sparingly. They are generally used to enhance meat with a strong flavour, such as game, including game birds, or tongue. The cones are used to flavour certain beers and gin (the word "gin" derives from an Old French word meaning "juniper"). In Finland, juniper is used as a key ingredient in making sahti, a traditional Finnish ale. Also the Slovak alcoholic beverage Borovička and Dutch Jenever are flavoured with juniper berry or its extract. Juniper is used in the traditional farmhouse ales of Norway, Sweden, Finland, Estonia, and Latvia. In Norway, the beer is brewed with juniper infusion instead of water, while in the other countries the juniper twigs are mainly used in the mash, as filters to prevent the crushed malts from clogging the outlet of the mashing tun. The use of juniper in farmhouse brewing has been common in much of northern Europe, seemingly for a very long time. Juniper berries have long been used as medicine by many cultures including the Navajo people. Western American tribes combined the berries of Juniperus communis with Berberis root bark in a herbal tea. Native Americans also used juniper berries as a female contraceptive. ^ Farjon, A. (2013). "Juniperus communis". The IUCN Red List of Threatened Species. 2013: e. Retrieved 10 November 2017. ^ Adams, R. P., Pandey, R. N., Leverenz, J. W., Dignard, N., Hoegh, K., & Thorfinnsson, T. (2003). Pan-Arctic variation in Juniperus communis: Historical Biogeography based on DNA fingerprinting. Biochem. Syst. Ecol. 31: 181-192 pdf file Archived 17 December 2008 at the Wayback Machine. ^ Höferl, Martina; Stoilova, Ivanka; Schmidt, Erich; Wanner, Jürgen; Jirovetz, Leopold; Trifonova, Dora; Krastev, Lutsian; Krastanov, Albert (2014). "Chemical Composition and Antioxidant Properties of Juniper Berry (Juniperus communis L.) Essential Oil. Action of the Essential Oil on the Antioxidant Protection of Saccharomyces cerevisiae Model Organism". Antioxidants. 3 (1): 81–98. doi:10.3390/antiox3010081. PMC 4665443. PMID 26784665. ^ Shorter Oxford English dictionary (6th ed.). United Kingdom: Oxford University Press. 2007. p. 3804. ISBN 978-0199206872. ^ Gotlandsdricka: Traditionell kultur som regional identitetssymbol, Anders Salomonsson, Skrifter utg. av Etnologiska sallskapet i Lund, 1979, ISBN 917400106X . ^ McCabe, Melvina; Gohdes, Dorothy; Morgan, Frank; Eakin, Joanne; Sanders, Margaret; Schmitt, Cheryl (2005). "Herbal Therapies and Diabetes Among Navajo Indians". Diabetes Care. 28 (6): 1534–1535. doi:10.2337/diacare.28.6.1534-a. ^ Tilford, Gregory L. (1997). Edible and Medicinal Plants of the West. Mountain Press Publishing Company. ISBN 978-0-87842-359-0. This page was last edited on 2 April 2019, at 18:01 (UTC).